10-6-12 – Why Hunt When You Can Fish! While many outdoor recreation friendly Vermonters were taking to the woods for the opening day of archery deer season, we were loading up the row boat to go catch some crappie on the Connecticut River. The fish we were chasing roam a deep river channel. The school of fish is large and we have found that the largest fish present lead the way for all. To locate the school, we usually begin by cruising around making long, fast casts with or without a bobber. The active fish usually are suspending 5-10 below the surface in 20+ feet of water. 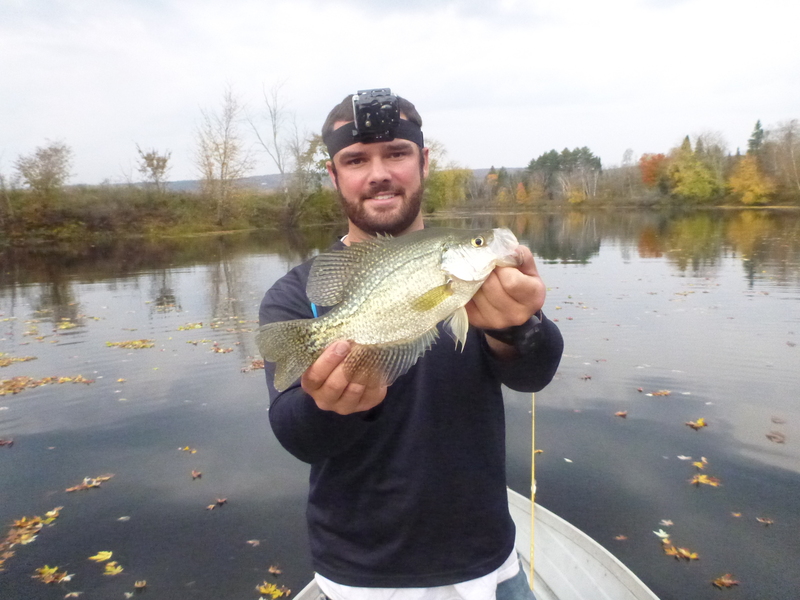 Once we start catching large crappie, we know we have hit it. To track the fish as they move around we have to determine if they are moving up or down the channel. To stay on the school, it is only a matter of staying ahead of their movements. It would be possible if we were to keeping fish to catch a limit in one pass but we have been releasing all fish in order to maintain a healthy population. The fish seemed much more spread out today than the previous week. We actually found the largest concentration of fish in an unusual place for the Glory Hole. Instead of being suspended over the deep water feeding on minnows they moved up on a flat and seemed to be feeding on a hatch emerging from the soft bottom. We boated at least a hundred fish in a matter of hours and decided that it was time to get home and get camo-ed up for the afternoon hunt. Good day of fishing once again using the “Live” Baby Shad made by LFT Lures. We put together two videos from our glory hole trip. Check out Ice Fishing Teaser and Opening Day Of Deer Season Crappie Fishing on our YouTube page! I do both. On more than one accassion my shotgun has accompanied me while I was perch or walleye fishing. We do both as well. It is just hard to hunt when the crappie are smashing! Thank you! 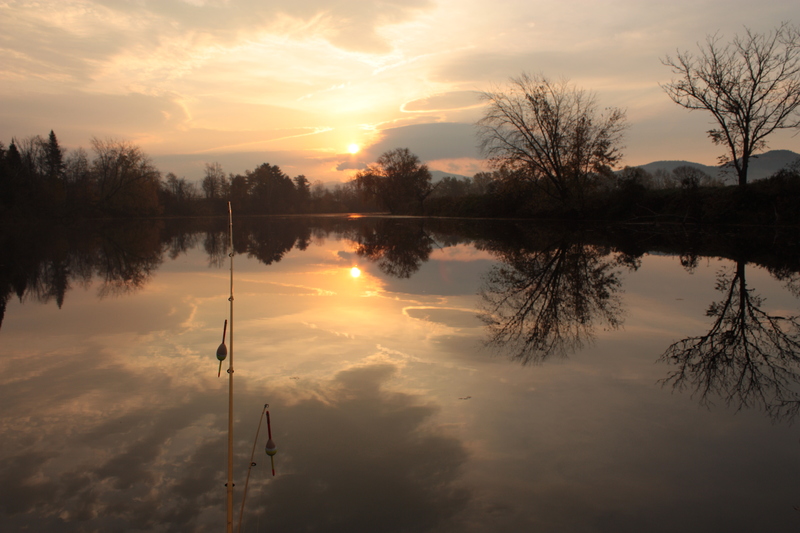 The sunrise was a great addition to a successful day of fishing! Nice! I’m in central Missouri and I took my boys on a Boy Scouts camping trip last weekend. We caught some good ones too! There’s a pic I just blogged about! http://bit.ly/QjESj2 Great to see your success! That was actually the sunrise! It was a great morning on the water! I agree–there’s something about being on or near water :-. the fish you caught are they edible? Yes. 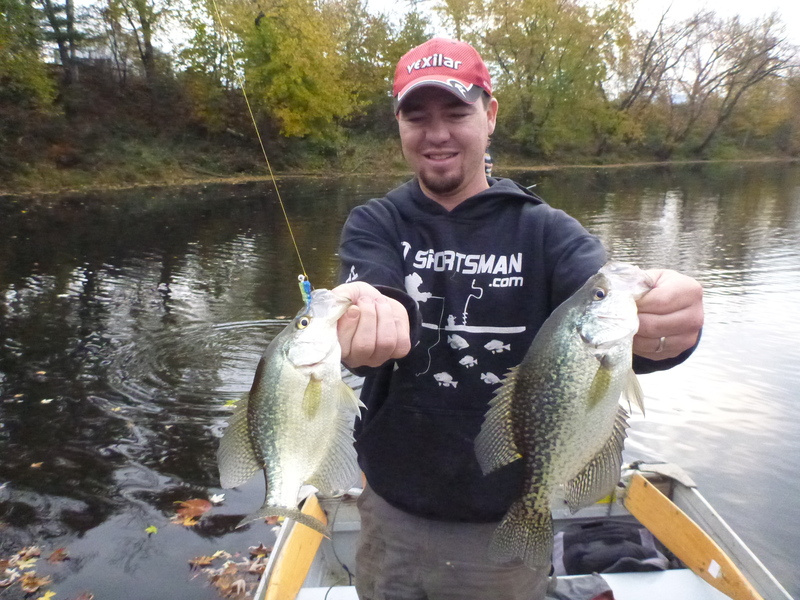 Crappie are a very desirable fish for the table. One of the best freshwater fish in our opinion! Darn right they are !!! Fishing, the real alternative to work. Love it !!! You’re not kidding! It’s as good as it gets! WOW! 100 FISH BEFORE AFTERNOON!?!?! How many people would that feed in one day? That’s incredible! 100 crappie could feed quite a few people! We weren’t keeping any though. We both already have a few meals in the freezer so it was just a relaxing day on the water. Walleye are a blast to fish for! We fish for them often. Not a fisherman (or woman) although it’s not foreign to me. But that sunrise! Sometimes worth going along for the ride. Spending time outdoors… That’s what it is all about! What an interesting article. It’s been too long since I have fished. I miss it very much. I just never seem to have the time anymore. But your post made me want to! Great! That’s a big reason as to why we started this blog. I sometimes bring a fishing pole while leisurely hunting Mallards or Canada Goose from a Radisson Canoe. That’s the way to do it! We were out during bow season though. Tough to hunt with a bow from a boat i bet! It’s fishing season! Out here in Oregon it’s mainly salmon, steelhead and trout in the fall and winter. What are you catching in your neck of the woods this fall? That’s a healthy Crappie! Congrats…reminds me of some cove fishing off Lake Travis in Texas, long, long ago. Crappie fishing is a blast! We can never get enough of it! Great story. I never saw a Crappie that large that wasn’t stuffed. We figure if we release some, especially the large ones, we will benefit more in the future! Funny how some people get outwardly upset when you tell them you catch and release, especially when you do it exclusively. I like to keep some and throw some back myself, but I never did understand why it would upset someone to do other than kill everything caught? Regardless what someone decides to do with their fish someone won’t agree. We like to eat but we also like to catch big fish. We figure by eating some and letting some go, we have the best of both worlds. Especially when we are selective with what we keep! What a beautiful blog and awesome fish! Glad you had a nice time, right? Any day fishing is a great day! Thanks for reading! Thanks for sharing! Fishing is a very nice experience! It sure is! Thanks for reading! Thanks for the share! Fishing is our passion! One of our favorites!!! Thanks for viewing! Reblogged this on HoneyHole Anglers Connection. What kind of fish is this? I havent seen it in Europe.